When we’re shopping for mountain bike accessories, we generally focus on things that will improve the ride. Brakes, seats, cables, and shifters are the most prominent purchases for new mountain bike owners. These are the kinds of things that you’ll notice while using your bike. What is it that makes these upgrades worthwhile for cyclists? It’s all about the experience. When you hit the trail and feel your bike perform better than it has before, you feel satisfied with your purchase. In this guide, we’re going to be looking at something different. These products won’t affect your ride at all. In fact, you’ll only find it useful when you’re not riding. In spite of this, you’ll want to buy one before you do any upgrades. Mountain bike stands are something that all serious enthusiasts have in their home. They fall into two distinct categories. Workstands are designed for anyone who plans to do their own maintenance or upgrades. They lift your bike off the ground, making it easier to access the mechanics. Sure, you might be able to lube your chain or make small adjustments to your brake tensioner without a work stand, but most major repairs are significantly more challenging, if not impossible without one. Floor stands are designed for storage, rather than maintenance. Even with the kickstand up, mountain bikes can take up a lot of space. When floorspace is in short supply, floor stands are used to store your bikes in the most space-effective way possible. You’ll see them outside of public buildings, giving you a place to park and lock your bike. But floor stands are also available for consumers, helping you free up some much-needed garage space. With the right stand, you can work on your bike virtually anywhere! Cycling is an individual hobby. There are just as many different bikes out there as there are riding styles. In an ideal world, we’d just be able to show you a single bike stand, say “this is the best,” and everyone would be happy with it. Although this seems like a simple tool, there is actually quite a lot to them. What works for one person won’t work for another, so it’s important to assess your needs before selecting a stand. To find out which one is right for you, you’ll need to think about a few different things. First, picture your environment. Where will you be using the bike stand? How much space do you have? What height will you require? Is the ground stable, such as a concrete garage? Or will you be working on the grass? These are all things we thought about when ranking these stands, and we’ll be sure to help you understand the limitations of each model. Next, you’ll want to think about your intended application. Are you only looking to store your bike somewhere? Or do you plan to do some work on it? If so, will you be doing simple repairs or advanced modifications? Finally, you should consider your bike itself. How large is it? Is it heavy? What is the shape of the frame? 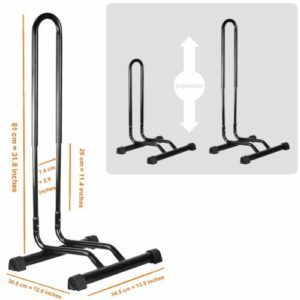 Bike stands come in all different shapes and sizes, and you’ll want to get one that can fit your bike. If you know the answers to these questions, we’ll be able to help you find the model that’s right for you. First, we’ll go in-depth and explore each of our favorite models one by one. After, we’ll show you which ones work best in each situation. As one of the most respected brands on the market, it would make sense that we started with a Park Tool stand. Their hardware is found in bicycle repair shops all around the world, as they offer some of the most durable and high-quality options on the market. 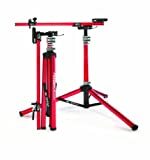 While their professional models may be too expensive (and often overkill) for general consumers, the Home Mechanic Repair Stand is designed specifically for the cyclist who prefers to DIY. The main advantage of this stand is simplicity. There is only one model available. It comes in a single size and a single color. Some may wish for other color options, but when other hobbyists see the iconic baby blue paint job, they’ll know that you’ve got a professional-grade bike stand. Despite the lack of options, this stand will fit virtually every bike on the market. The screw-lock clamp is adjustable and can fit tubes as small as 7/8th of an inch, all the way up to three inches. The oddly shaped grabbing edges of the clamp serves an important purpose – they provide flexibility. This stand isn’t restricted to round tubes. It can grab aerodynamic seat posts, squared tubes, and other uniquely shaped mountain bike structural elements. Thanks to the unique tripod design you can work on bikes of all weights. Virtually all of the pressure is applied to the inner leg, which is the most structurally supportive part. The two extended legs keep the stand well balanced, so there is no risk of tipping. This allowed Park Tool to make the arms swivel 360 degrees so you can rotate the bike as you work on it. This is a purchase that you’ll have for years to come. Every single component is designed with structural integrity far beyond the forces you’ll every subject it to. Sure, it’s simple in terms of features. Sure, there aren’t many accessories available for it. But at nearly twice the weight of most entry-level aluminum stands, you can immediately tell that this is built to last. Every moving part is simple, and that’s why mechanics trust these stands to withstand many years of daily use. It doesn’t matter whether you’re trying to store a few of your own bikes, or provide your visitors with a place to store theirs. The simple and affordable design of this multi-bike stand sets it apart from the crowd. From a functionality perspective, this stand is both simple and impressive. Each individual stand features two supporting bars, with two rubber feet that prevent it from moving. Attached is a large tubing loop. The tire of your bike slips right inside this loop, and thanks to its adjustable height you’ll always get a snug fit. Want to store more than one bike? Just join them together. If you’re storing small bikes, all of the stands can be placed side to side, facing the same direction. This is the most space efficient manner of storing them, but the fit will be a little too snug for larger bikes. In this case, just alternate the direction of the stands. Bikes will face each other, ensuring that their handlebars don’t meet. For their simplicity, versatility, and affordability, these would be our first choice for anyone who only needs to store their bikes, and doesn’t need to work on them. If you enjoy wrenching on your bike almost as much as you love riding it, then you need professional grade tools. This means more than durability, you need versatility. 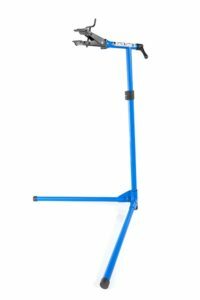 In this regard, there are very few repair stands that can compete with the Feedback Sports Sprint Work Stand. When we first opened the box, we were shocked at how compact it was. It’s less than three feet long, and only ten by six inches in width and height – smaller than your typical baseball bat. Despite how compact it is when folded up, some creative design allows it to fold out into a full size stand. 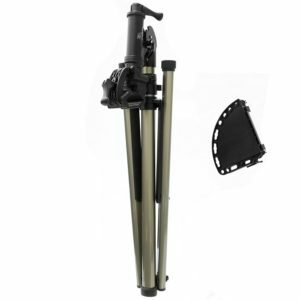 The first thing you do is open the tripod leg design. Each leg is evenly sized, which allows you to keep it balanced no matter what direction it’s facing. You then fold the supporting arm up. You attach your bike using a single quick-release mechanism. With the tire off, it clips into your fork. This allows you to get it up onto the stand in seconds, but doesn’t compromise stability. The clip is adjustable, which allows it to fit any size bike. You can also slide the supporting lengthwise, which allows you to experiment with different balance points. No matter how much hardware you’ve stripped off the bike, this stand will always keep it balanced. Whether you mount the front of the rear axle, the rubber cradles will protect the finish of your expensive bike. Whether you’re working on customers rides or your own, this is one of the most versatile stands on the market. Sure, some of your bike components are located in awkward positions. The general consensus is that any bike stand with a vertical adjustment is better suited towards complex repairs. While this is true in a few unique scenarios, this isn’t the real reason stands have height adjustments. Do you prefer to sit when you work? Or would you rather stand? The answer to this question will determine whether you want a height adjustment or not. Stands with height adjustment are typically much taller than compact models. 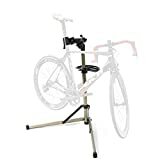 If you’d rather to sit (regardless of whether it’s the floor or a chair) then a bike stand like the one above is a better option. But if you like to stand, then we’d select a full-size stand with a larger height adjustment. If you’re a cyclist who can’t get enough of those tough mountain trails, you know that wipeouts are inevitable. Though we try to avoid cuts, scrapes, and spills whenever possible, we accept them as a part of the sport. When you’re taking air, it doesn’t matter whether you nail the landing, or head over the handle bars. Your bike is taking a lot more force than most cyclist exert on their bikes. This means two things: you’re going to have to do some upgrades, and you’re going to have to do some repairs. If you’ve been riding for a long time, you may already have a work bench set up. In that case, you’re fortunate enough to use one of the most stable stand types on the market: a bench mount stand. This stand sits on a flat metal bar, with four holes drilled in each corner. It’s designed to be bolted directly to the work surface of your bench. But once it’s in place, you’ll be blessed with one of the highest weight capacities on the market. It can easily hold upwards of 200 lbs. this means that even if you’re working on a heavy bike, throwing all of your body weight into a bolt that just won’t seem to come undone, this is one of the few stands that will hold up. Just as the mountain bracket is designed to withstand more pressure, so is the clamp. This all-steel design is machined from solid piping, and doesn’t include a single weld. Every piece is bolted on. In the unlikely even that something gets damaged, you can replace or modify every moving part. There are two different sizes available, each of which are suitable for different tubing sizes. But if you’ve got the money, then this is a stand that you won’t regret. For cyclists looking to save money, there are plenty of affordable repair stands out there. Although finding options is easy, finding good options is a challenge. brands, and it doesn’t have a feature list as long as others. 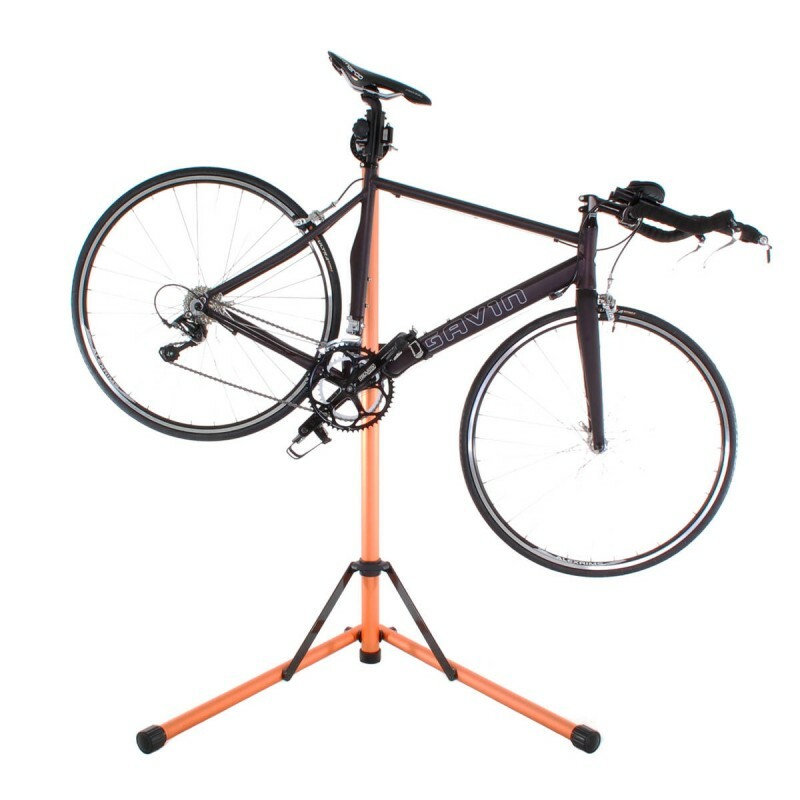 What it is is a simple, well made bike stand available at a surprisingly low price. The bi-pod design is made from square aluminum tubing, providing a nice balance between durability and portability. When not in use, it folds up into a very compact unit. This means that you can easily store it away, and aren’t left dedicating valuable garage space to something you use infrequently. The clamp, at first glance, seems fairly rigid. It’s not like those adaptable models you find elsewhere, but we were quickly surprised. It’s not the clamp that adjusts, but the arm. Rotate it 180 degrees, and you’re able to grab onto the lower tube. When upright, you can grab onto the top tube. This gives you enough versatility to do most repairs, and enough stability to work alone. For the money, there aren’t any better options. This is the most elegant bike stand we’ve come across. The design is distinctly minimalist, and yet it’s perfectly functional. Manufactured from a single piece of aluminum, Bikehand designed this stand with both creativity and ingenuity. Take the stylish holes, for example. They look like an ultra-modern design trend, but they actually serve a purpose. These holes reduce the weight of the stand, without impacting it’s strength. The same can be said for the wavy pattern on the bottom. Bending a single sheet of aluminum will always result in a stronger end product. Using the stand is just as simple. 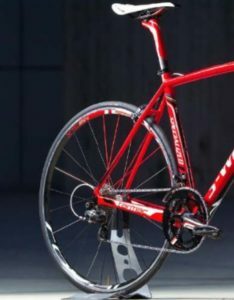 Place the tire in the groove, and the forked end will slip up into the rear hub, holding your bike upright. This is a great choice for those that want to display their bike, perform simple repairs, or who have limited space. It’s a popular option for apartment owners, who don’t want to risk their damage deposit by installing ceiling mounts, but who also don’t want to waste valuable storage space on their bicycle. 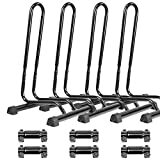 Which Bike Stand is Right for Me? Now that you’ve seen our top selections, you’ve probably got an idea of which one will best suit your application. Although our list represents the best bike stands on the market, there isn’t a single model out there that will do everything. Our objective was to cover the needs of all consumers, and each choice was selected with a specific purpose in mind. Casual cyclists may not have the need or desire to do their own mechanical work. But every bike owner needs a way to store their bike. 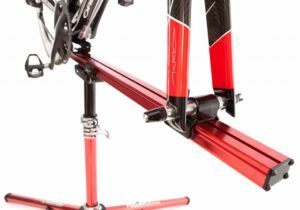 That’s where the CyclingDeal Adjustable 1 to 6 Bike Floor Stand comes into play. If you’re going to be storing your bikes in a fixed location, the low price and adaptability of this stand make it an excellent choice. There are multiple ways that each individual stand can be joined together, giving you the power to find the most space-efficient way to place bikes of all shapes and sizes in storage. Whether you’re setting it up in the back yard or in the garage, this stand can be configured to work the way you want. 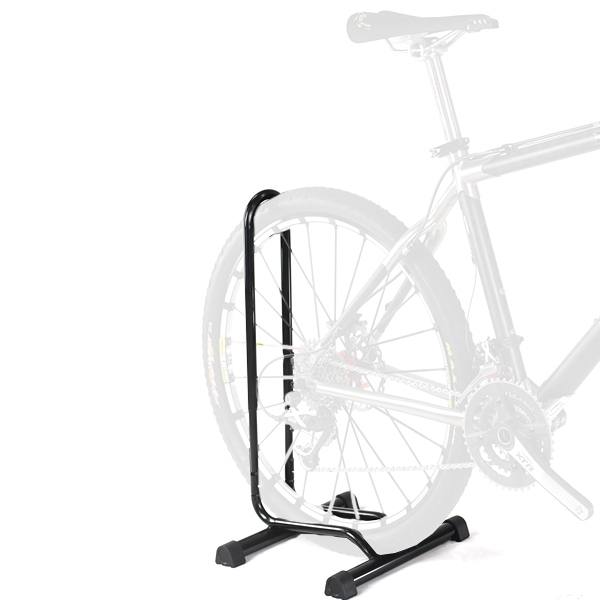 Looking for a stand that will help you show off your bike? Whether you’re riding a mountain bike or a road bike, many of us have made a significant investment in our favorite mode of transport. With the beautiful colors, sleek lines, and shiny hardware available on modern bikes, it almost seems a sham to hide it away in the garage. With the Bikehand Rear Hub Mount, you’ve finally got a sleek and simple way to show off your favorite possession. Although extremely durable, it’s one of the most compact stands on the market. When in use, it’s virtually invisible. All you’ll see is your bike standing proudly, waiting to be ridden. With these stands, you can do repairs from the comfort of your own home. If you’re planning on doing some upgrades or repairs on your bike, you’ll need a repair stand. 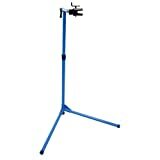 For most users, the Park Tool Home Mechanic Repair Stand fill fit the bill. It’s basic, but well made. Thanks to it’s adaptable clamp, it can fit bikes of all shapes and sizes. This means that your whole family can use it, and nobody is going to be left out. Next time you blow a tire, lose a chain, or need to tighten your breaks, you’ll be able to carry out the repair quickly and effectively. Though it is slim on features, the incredibly durability means that this stand should outlast all of your bikes, making it an investment that will pay dividends for years to come. On a tight budget? 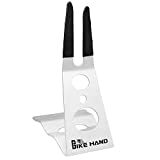 If you number one goal is to save money, then the Bikehand Pro Mechanic Bicycle Stand is a tool that will pay dividends. Most simple repairs will still cost $40 to $50 at a repair shop. 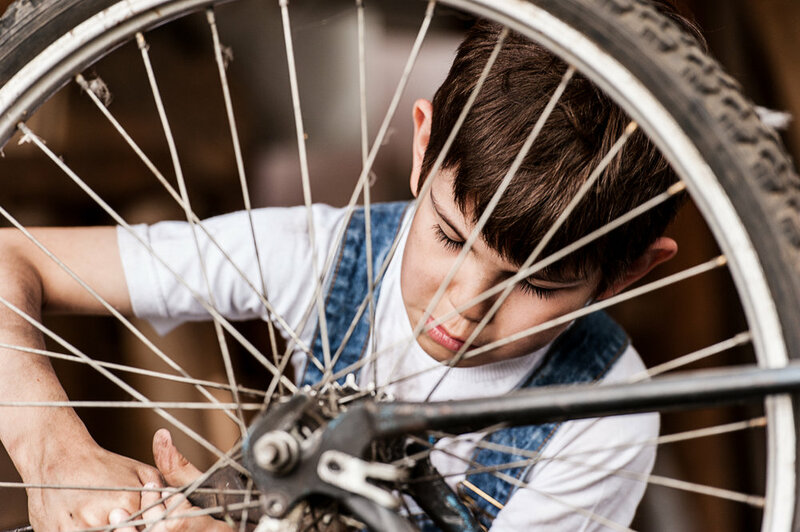 But bike mechanics aren’t complicated, so users on a tight budget can save money by doing it at home. Most of the tools required are basic, making this stand the only purchase you’ll need to make. With just two repairs, you’ll have paid off the cost of the stand. If you’re handy with a wrench and would prefer to keep your money, then this is the best entry-point. When you look at a bike, what do you see? If you see a finished product that’s waiting to be ridden, then this isn’t the stand for you. But if you see a platform, waiting for you to add your own unique touch, you should check out the Feedback Sports Spring Work Station. This is the number one stand for riders who like to upgrade their bikes. When you’re adjusting tension, running new brake lines, or carefully balancing a number of different mechanical components, positioning is everything. 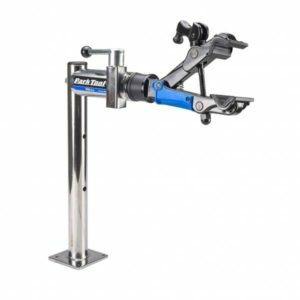 This is the most flexible and easy to adjust stand on the market, so you’ll be able to work on your bike in the most ergonomic manner possible. When not in use, it folds up into an ultra-compact shape, so you can stash it away for later. Have you already built a professional work bench of your own? Are you working on heavy bikes, or exerting large force during your repairs? If so, there is only one stand for you: the Park Tool PRS-4.2 Deluxe. This bench stand is different from any other model on our list. It has a short stainless steel support, and an all-metal construction that is virtually bomb proof. It bolts directly to your work space, so you’ll keep all of your tools within arms reach. For professional mechanics and hobbyists alike, this is the ultimate in bike stand technology.